The MTA is constructing a new subway entrance a block away from the First Avenue L train stop. EAST VILLAGE — Work on a new subway entrance for L train passengers at Avenue A and 14th Street is now underway, according to signage posted by the MTA at the intersection. The agency is currently building a new entrance a block away from the First Avenue station to help relieve congestion at the stop, which last year hosted an average of 23,195 riders per weekday, according to MTA data. A power substation is also being built on Avenue B to allow the MTA to operate more L trains, according to signs at the site. The MTA in 2015 announced the construction of the new entrance as part of a series of capital projects along the Canarsie Line, which services the L train. It got the ball rolling that year as it set aside $40 million in its budget for the project as well as improvements to the Bedford Avenue stop, but did not provide a timeline for the work. As work on the entrance begins, the agency has relocated stops for two local buses, according to signage at the intersection's now-defunct bus stops. The M14A will pick up and drop off passengers just around the corner on Avenue A between 14th and 13th Streets instead of on 14th Street. 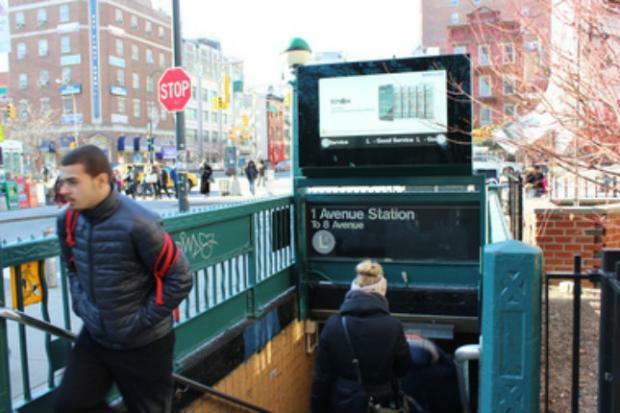 The M14D will skip its usual stop at 14th Street and Avenue A altogether, according to signs, which instruct passengers to walk to the closest stop at Avenue B. Bus shelters that were removed from Avenues A and B will be replaced once the construction is complete, according to Town and Village, which first reported news of the stop relocations. The MTA had previously said it would begin "preliminary work" at 14th Street and Avenue A ahead of the 15-month L train shutdown in June, including soil testing. 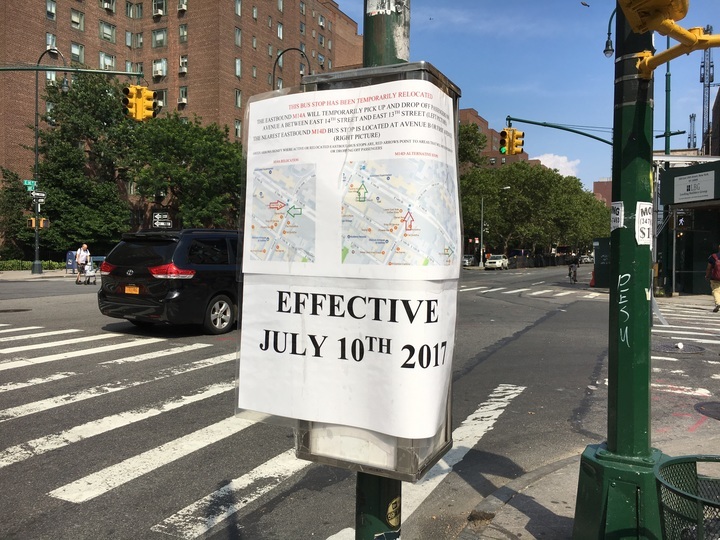 The signs do not provide an end date for the relocations, and the MTA did not immediately return a request for comment.